Take control, and settle for no less than the best. From iPhone to iPad to Apple TV and even your Apple Watch, Lightbow will help you get the most out of your Philips hue, LIFX, or WeMo lighting setup. There's nothing else like it, and we can't wait to welcome you to the community! Lightbow is fully localized for Russian, German, Swedish, Spanish, French, Dutch, Japanese, Chinese (Simplified & Traditional), Brazilian Portuguese, Norwegian, Greek, Korean, Hungarian, and Italian. If you want to help us translate Lightbow for your native language, please contact us. The process is quick and easy! Lightbow has the highest quality and quantity of stunning animated presets (available as in-app purchases), plus the most powerful editor to create your own! Take full advantage of Philips hue, LIFX, and Belkin WeMo, or control them all at once with presets, animations, groups, triggers, transitions, and more! Check here to see which features are supported in your specific setup. From theater productions, to mood lighting in a restaurant, to everyday home living, Lightbow has something for everybody! Combine custom multi-step animation loops, static colors, or ON/OFF/Brightness commands for any sets of lights or groups. Activate them all with a single tap, and enjoy them even when Lightbow is running in the background or your iPhone / iPad's screen is asleep! Share presets with others in your household on your local WiFi network—no emails or passwords necessary! Give each preset a transition, such as crossfade, flashbulb, or fading through a specific color. 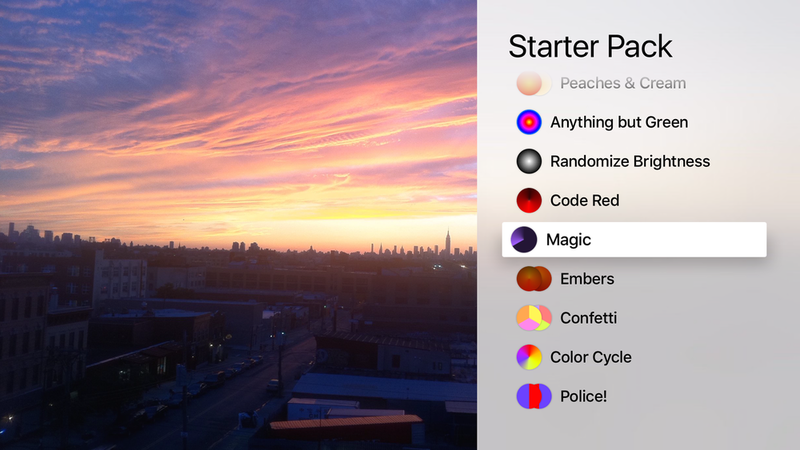 Quickly capture the current color settings of all your lights, or start with a clean slate and build your assignments manually. Organize your Presets into Collections for greater flexibility and scalability. Activate any preset with countdown timers, alarms, events like opening/closing Lightbow, or even a shake of your phone. For hue tap owners, choose the colors and fade time that each button will trigger on your Philips lights. Put your Philips or LIFX hardware into groups to control sets of lights together. Group lights by room, function, or anything else. Lights can be in multiple groups! Set a color on different models of lighting hardware, and Lightbow will automatically calibrate that color to match up where possible. From one simple screen, you can rename, reorder, and switch on or off any of your lights. Set the mood of a room with control over the hue, saturation, brightness, and color temperature of each bulb. Connect to a Philips bridge to control your Bloom, hue, LightStrips, LivingColors, Iris, Aura, LivingWhites bulb, or even the LivingWhites wall plug. Use your Belkin WeMo Outlet, LightSwitch, or Insight hardware to turn any electrical device on or off, not just lights! Enjoy your LIFX bulbs using the same familiar interface. Lightbow will continue to add support for new lighting hardware as it is released.